Baraga Shrine Pasties Almost Every Day! We are happy to announce that beginning June 29, for the next two months, delicious, homemade hot pasties will be available at the Baraga Shrine Gift Shop from Wednesdays until Saturday. Up until now, frozen pasties were available every day, but hot pasties were only available from Thursday through Saturday (so we added an extra day!). Al Theut, our master pasty chef, will be working double duty preparing an early batch each week. 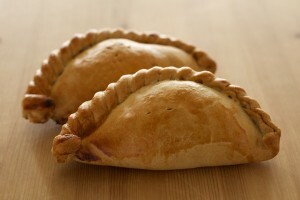 Our pasties are filled with beef, potatoes, onion, carrot and rutabaga. The generous sized pasties cost just $4.50. If you want to pick up more than five, call ahead to make sure we have extras available for you(906-524-7021). Many people have commented that Al’s pasties are the best they’ve tasted in the U.P. !